What is a certificate of insurance and why do I need one? Your business just won another contract—hooray! But before you and your team can start work, the client asks for a “certificate of insurance. A Certificate of Insurance is a straightforward document to share with others to show that your business is covered for workers' compensation. It includes basic information like your policy number, effective dates, your line of work, your business name and address and contact information for your insurance carrier. Why do you need to share this information? Well, certain clients and contracts will require proof of workers' comp insurance before hiring your business—especially if it's for a job where liability is a concern. Proof of insurance (and making sure the coverage dates are current) helps give everyone involved more peace of mind. Typically, clients or contracting agencies will contact you, and you'll have to then contact your insurance company to request a copy of this certificate. Not the most efficient process, right? But with Cake, it's now a piece of…well, you know: simply log into the Client Portal and, in just a few clicks, you can email a copy of your certificate. Interested in an easier way to get workers' comp coverage and email-friendly Certificates of Insurance? 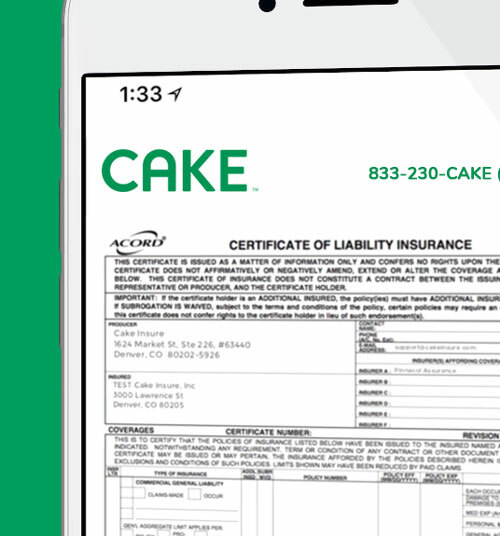 Get a quick quote from Cake Insure.